When the New York City Police Department publicly found fault a few weeks ago with the design of the Freedom Tower at the World Trade Center site for being too close to West Street for security precautions, David Childs was told to go back to the drawing board. The problem arose because the state and the city decided against creating a vehicular tunnel alongside the site, a tunnel that had been objected to by Goldman Sachs, the investment banking firm that had been considering building a new building nearby. The decision not to built a tunnel was not a good one as it would have permitted much easier access to Battery Park City and more open space in the area, two very worthy goals. Just shifting the Freedom Tower to the east to meet the objections of the city's security forces would require an enormous reworking of the all the plans for the entire World Trade Center site and state and city officials were eager to come up with a solution quickly, partly in response to considerable recent criticism of plans for the site from a variety of critics including Paul Goldberger of The New Yorker Magazine and Ron Rosenbaum of The New York Observer. The unveiling of Mr. Childs's new design June 29, 2005 was a dramatic surprise for it bears little relation to Daniel Libeskind's original winning entry for the tower and the master plan, nor to any of the many previously submitted designs. Virtually the only Libeskind element of the design that remains is the height of the antenna - 1,776 feet. Childs's new tapering design is not bad and is in fact a more attractive tower than the previous design that had a canted roof line topped by a tall cage with wind turbines beneath an antenna. His solution to the new security concerns is to raise the tower on a 200-foot-high base clad in patterned metal, in essence a security bunker. While the previous tower was somewhat "twisted," the new one has angular inclines and a pin-strip-like curtain wall that is somewhat reminiscent of the facade design of the former twin towers at the World Trade Center. 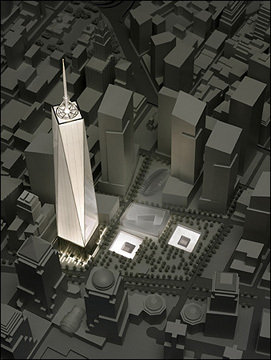 Childs's design has elongated isosceles triangular facades rising from the square base and narrower ones descending from the square top of the office tower that is 1,362 feet high, above which there is a circular platform eight feet higher, both heights demarking the heights of the twin towers of the World Trade Center that were demolished in the terrorist attacks of September 11, 2001. The antenna, which is supported by cables that rise from the rim of the circular platform, rises up to a height of 1,776 feet. The new design has moved the base of the tower 40 feet to the east. The former design had a trapezoidal base. The changes will require the relocation of the 20-ton granite cornerstone that was laid last July 4 by Gov. George Pataki. Construction is anticipated to begin next year with completion scheduled for 2010. 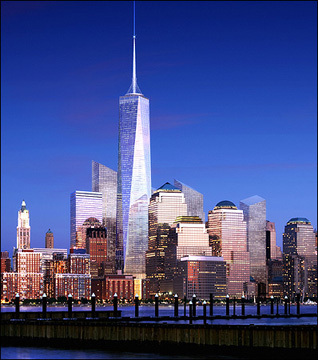 The tower is in the northeast corner of the 16-acre former World Trade Center site and it will overlook the memorial and a cultural center. The tower will contain 2.6 million square feet of office space on 69 floors, two observation decks and the Manhattan Television Alliance broadcast and antennae facilities. The 200-ft.-high base, which is 200-ft. square in plan, will be clad in patterned metal and three-foot-thick walls. It will contain a 80-ft.-high public lobby and mechanical equipment. The architecture critic of The New York Times, Nicolai Ouroussoff, was not enthused by the new design. "The temptation is to dismiss it as a joke," he wrote on June 30, adding that "The effort fails on almost every level." 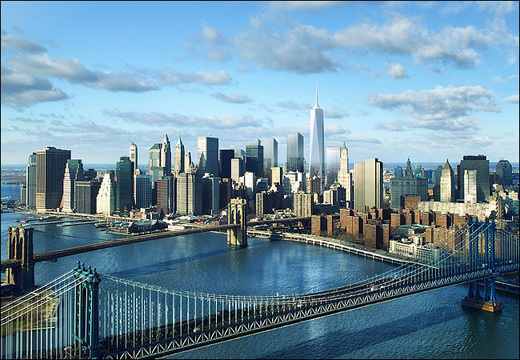 The lead editorial in the same edition, however, maintained that "In almost every respect, the new design for the so-called Freedom Tower....is better than the one it replaces." "New Yorkers had reason to watch the public presentation of this new design with some skepticism," it continued, adding that "We have seen so many designs, so many models. We know now, unhappily, that the final plans, whatever they are, will likely be hammered out in private." The plans for the rebuilding of the World Trade Center site have been mired in controversy and in recent weeks attacks on the plans mounted. 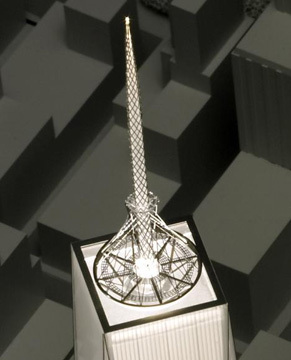 On May 30, Paul Goldberger wrote in The New Yorker magazine that the Freedom Tower was "an unnecessary building," and urged more small-scale housing in Lower Manhattan. The day before, Frank Rich, a columnist for The New York Times, asked "What sane person would want to work in a skyscraper destined to be the most tempting target for aerial assault in the Western World?" In the June 27-July 4 edition of The New York Observer, columnist Ron Rosenbaum suggested it was "dreadfully apparent now that the entire project - and the lives of its potential inhabitants - is in the hands of a group of egotists, idiots, political opportunists and incompetents?" Meanwhile, controversy continues to swirl around the recently announced cultural center nearby on the site, not because of its very intriguing and fine design, but because of concerns that its organizations - the International Freedom Center and the Drawing Center - may present exhibitions that might be objectionable to some. The organizations involved are worthy and censorship is not appropriate, but one might argue that its large presence is perhaps too close to the memorial and might be better located on the deck created by a tunnel under West Street, a tunnel that should be resurrected. The new design of Freedom Tower is extremely elegant if the cladding of the base is well done and sparkling and if the curtain wall is jewelly and silverish. It is an appropriate height and scale and certainly would not be the only possible target of terrorists in the future. Gov. George Pataki, Mayor Bloomberg and Larry Silverstein, the developer of the site, are right in their proud defiance and lofty ambitions. If you don't want to go into the building, don't, but you'll miss a hell of a view. The new design is not as grandiose and flamboyant as many of the designs that the public has been offered in numerous rounds of competitions and presentations. It is, however, refined and sophisticated. In his critique, Mr. Ouroussoff said that "the new obelisk-shaped tower...evokes a gigantic glass paperweight with a toothpick stuck on top." Perhaps he would have been happier if the toothpick skewered a maraschino cherry, or, more appropriately, a candied apple. It's true that the designs offered for the tower have had more flavors than Baskin-Robbins or Coldstone Creamery. For decades, until very recently, the city has suffered from a lack of architectural excitement while the rest of the world has exhuberantly enjoyed a golden age of architectural innovation and widespread brilliance. The design climate in the city, however, has shifted much for the better by and large and there are now many interesting and fine projects of all sizes sprouting all over. The new design may not be cutting-edge in terms of form, but in terms of technology and security it will be just fine.